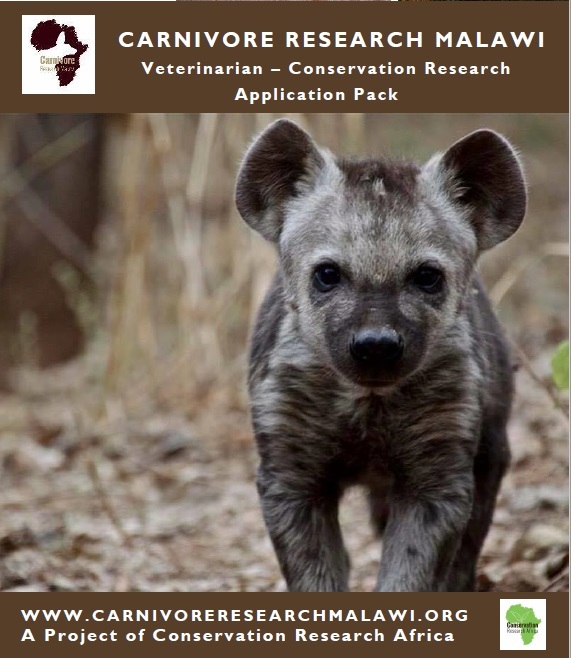 WVI’s partners Conservation Research Malawi (CRM) is looking for a vet to work on their Urban Hyaena Research project based in Lilongwe. The project is looking for a vet to work with their Urban Hyaena Research project based in Lilongwe, Malawi. The project informs the human wildlife conflict management. The position is for 6-8 months to start ASAP. It will include accommodation and bills, work related travel, airport transfers and limited personal use of a project vehicle. They may be able to cover flights and contribution to food. You will be required to cover visas, insurance and vaccinations. CRM are looking for a fully qualified veterinarian with 2 + years of clinical experience. Wildlife/exotic experience is a plus. The candidate must have attended a capture course for African wildlife OR have significant experience with darting in a zoological setting. For more information on the job itself, the stunning setting and the requirements please see their Application Pack. An amazing opportunity for someone.